Training and Racing With a Power Meter Journal: Aero tires and wheels: skinny vs. fat? Aero tires and wheels: skinny vs. fat? For almost 30 y, those "in the know" with respect to the aerodynamics of bicycle wheels (e.g., Chet Kyle, John Cobb) have emphasized the importance of tire width in determining overall speed. Specifically, it has long been held that it is important to closely match the width of the tire to the width of the rim to minimize aerodynamic drag, and that doing so usually outweighs any increase in rolling resistance resulting from use of a very narrow tire (e.g., 19 mm). There are, however, some real (or at least perceived) disadvantages to using such narrow tires, such as poorer handling (especially on imperfect pavement), reduced comfort, increased susceptibility to pinch-flats, etc. Thus, during the last decade manufacturers such as Zipp have attempted to design wheels that exhibit less of an increase in aerodynamic drag when used with a slightly wider tire (e.g., 21-23 mm). In Zipp's case, this initially entailed incorporating a bulge just below the brake track, which helps smooth the turbulent flow coming off of the tire. More recently, first HED and now Zipp have introduced wheels where the brake track itself has been widened, and at least in Zipp's case the rest of the rim significantly reshaped, with one goal of these wider wheels being to permit use of wider tires while still minimizing aerodynamic drag. (Other purposes are 1) to reduce drag at higher yaw angles, i.e., beyond the point at which previous designs tended to stall, and 2) to minimize wind-induced steering torque.) Indeed, HED claims that even when using the same width tire, the wider brake track itself significantly reduces rolling resistance by allowing the tire to assume less of a "lightbulb" shape". Notably, however, this latter claim has not been supported by direct measurements. Another factor seemingly contributing to the current trend toward use of wider tires, even by time trialists, is the more widespread availability of quantitative data for the rolling resistance of various tires. In particular, Al Morrison's well-known roller tests have enabled cyclists to choose tires based on direct measurements of their rolling resistance, and not just based upon manufacturer's claims. Apparently as a result, people are more cognizant of just how much time can be gained via judicious selection of better-rolling tires, and have tended to focus more upon this and less upon aerodynamics. In apparent opposition to the above-described trends, however, the field testing that I have done implies that, at least at/near a yaw angle of 0 deg, narrowness is still a key element when it comes to selecting tires and wheels in an attempt to maximize speed, and that you still need to carefully consider the trade-off between aerodynamic drag and rolling resistance when selecting your tires and wheels. Since the results of such tests only reflect what is happening at very low yaw angles and the sensitivity of such "real world" bicycle-plus-rider measurements is less than what can be achieved when testing wheels in isolation in a wind tunnel, I do not profess to have the final answer to the "skinny vs. fat" debate. Nonetheless, I believe it is worth sharing the results of my experiments, if only to raise peoples' awareness regarding this issue. Based on Chung-style aerodynamic testing performed on an indoor velodrome, Alex Simmons has reported that, at least on some occasions, a tubular Campagnolo Shamal front wheel appeared to be significantly more aerodynamic than either a Zipp 808 or flat disk wheel. In other experiments, however, the results were reversed, i.e., the Shamal was measurably slower, leaving the question of which is the faster wheel unsettled, at least in my mind. when fixing the Crr to the mean value obtained during the two back-to-back tests, my CdA when using the Shamal was only 0.001 m^2 higher than when using the 808. Given the amount of effort that has been expended in the last decade by Zipp (and others) to optimize wheel aerodynamics, these results imply that narrowness, per se, still remains a very important determinant of aerodynamic drag, at least at/near 0 deg of yaw. While in the above tests the narrow Campagnolo Shamal performed quite admirably relative to the more modern Zipp 808 wheel, the latter was still slightly faster, even at/near 0 deg of yaw. In addition, it would be expected to do even better at higher yaw angles, and I already owned the wheel. For my next series of experiments, then, I set about trying to determine the optimal tire to use on it. Although Zipp has stated that the aerodynamics of the wheel are less impacted by tire width, to my knowledge at least they have never claimed that it performs better with wider tires. Based on the earlier data of Kyle, Cobb, etc., I therefore decided to compare three different 19-20 mm (nominal) tires with known, similarly-low rolling resistance but reportedly differing in aerodynamic drag. Because the results of my testing may very well be specific to my wheel and the test conditions, I will refer to them simply as tires (they were usually tested in pairs, so all data have been corrected to reflect that fact) A, B, and C, respectively. Figure 1. Power versus speed relationship when using tires A, B, or C (in pairs). 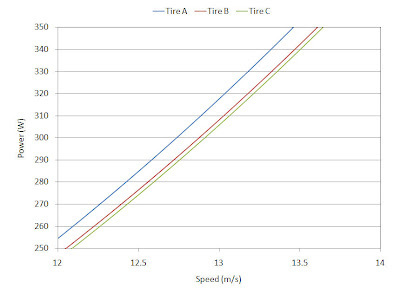 As can be seen in the figure, when compared to tire A, using tire B would reduce the power requirement at my nominal TT speed by ~10 W. Stated another way, assuming the same power output the use of tire B instead of tire A should theoretically save me ~34 s in a 40 km TT. All of this estimated time savings is due to the lower CdA of tire B, as the Crr of this tire is actually slightly higher than that of tire A. As can also been seen in the figure, the difference between tires B and C is much smaller, amounting to a power differential of only ~2 W, or a time differential of only ~10 s. In this case, however, the theoretical time-savings is due entirely to the difference in Crr between tires, as CdA did not differ. The question then becomes, what is it about tire A that makes it aerodynamically inferior (or conversely, that makes tires B and C aerodynamically superior)? That is something that cannot be stated with certainty, but it is interesting to note that 1) although all three tires are nominally 19-20 mm in width, based on direct measurements tire A is actually ~1 mm wider, and 2) although tires B and C are significantly different in other respects, their width is nearly identical. These observations, along with other experiments that I have performed, suggest to me that the difference in CdA between tire A and tires B and C might very well be due to the subtle difference in width alone. As stated before, I do not claim to have any final answers with respect to optimal wheel or tire design/width. Rather, my purpose in sharing the results of these experiments is to simply encourage people to carefully and quantitatively consider various factors when attempting to determine the wheels/tires that are best for them and the conditions under which they expect to compete. Now that 2 y have gone by, I guess I can now share the key: tire A = VeloFlex Record, tire B = Bontrager AeroWing TT, tire C = Continental Supersport. Could have been those aero wings! Still think you should have gone on testing your 808's with 23's ano 25's! I would like to purchase the wheel to fit into my new car. One of my tire is damaged so I was searching good quality of tire for my car.